Take a Look at Snook Fishing Action! Looking for some fierce action on the end of your fishing line? Look to snook! Snook are also known as Sergeant Fish or Robalo and hang out in the warm waters of the Atlantic Ocean. Snook are almost colorless, often with yellow fins and a black lateral line (along its back). Long and lean, they resemble the northern pike. Trolling for food in the western Atlantic Ocean, from South Carolina to Texas, snook like to stay in waters that are less than 70 feet deep. Some of the largest snook have been caught off of the Florida coast (44 lbs.). Although considered a warm saltwater specimen, snook easily transfer into fresh water; they prefer lagoons and estuaries. The amount of salt in water is not a problem for the sergeant fish, but they are very sensitive to water temperature. These fish only appear in warm waters … if water dips below 60 degrees (Fahrenheit), their systems go into shock and then they die. If water turns cold, look for the snook near power plant water discharge areas. Otherwise, they like to hide in underground structures (rock piles, reefs, etc. ), waiting for smaller fish to cross their path. Mullet is a good bait fish; however, snook have a decided preference for live shrimp. Only use enough weight (sinker or split-shot) on your line to get the bait to the bottom. If you want to use a jig or lure, some favorites are: some Mirrolures or the Red Tailed Hawk jig. Biologists tell us that the snook are most active feeding from an hour before high tide through the first 3 hours of the falling tide. Between April and October, snook tend to spawn in the inlets and passes near open waters. After a few weeks of life, the young robalo move into nearby estuaries – where they stay for the rest of their lives. They do not roam over as large a territory as other fish. Freshwater anglers sometimes report catching snook when they are fishing for largemouth bass. Most robalo are caught in the summer months. They are a popular game fish for two reasons: they are fierce fighters and they are taste great! Once you set the hook in your snook, the race is on! They don’t come in quietly, but put up a great fight. Getting a snook to take your bait is just the first step. It requires strength and patience to haul in a snook. on March 1, 2011 at 12:52 am Comments Off on Take a Look at Snook Fishing Action! Getting Your Share of Smallmouth Bass Action! Disclaimer: There are many ways to fish successfully. This is one of them. There are other ways … but this one works for me. I expect newbie anglers will be my audience. Smallmouth and Largemouth Bass have enough differences that we treat them separately. Today– Smallmouth Bass. Small Mouth Bass are Feisty Fighters and Fun to Catch! A member of the sunfish family, smallmouths are rather picky about the waters they honor with their presence. The temperature in streams, rivers, lakes, etc., must be rather cool. In the spring, the females move to spawning flats * when the water temperature heats up between 48 to 55. When the water temperature reaches 60 to 65, smallmouths get frisky and start the spawning process. Smallmouths are also picky about pollution. They will not live in polluted waters. Even better, they prefer oxygenated waters. Understanding the paragraphs above will help you catch more bass. First, let’s talk about oxygenated water. As water splashes against rocks and other barriers, the water mixes with the air. This makes the water more oxygenated. Thus, you will want to fish for smallmouths wherever water can be re-oxygenated – around boulders, in riffles and under/in underwater structures (weed beds, rock formations, log jams, etc.). Try smaller lures and hooks in the springtime. Look for water with a gravelly bottom. When you are thinking about live bait, consider the crayfish. We carefully polled as many smallmouths as we could find and they assured us that they prefer crayfish. Smallmouths are not interested in the heat of summer. As the water heats up, they move to deep pools (during the day). They only emerge from sundown till sunrise. This is the best time to fish. They will move into shallow areas, rock piles and in reefs. Now the water is cooling down and the smallmouth bass prefer the deep pools because the temperature is steady. Again, these bass will come out of the pools to eat at night. Smallmouths stay in deep pools – where the temperature is constant. They are not very active. Mostly, they chase small bait fish (that are also in these deeper pools) during the cold months. Crayfish, Mepps spinners, Rebel, jig and pig, Rapalas & spinner baits. * Spawning flats have a gravel floor in 8 to 10 feet of water. on February 15, 2011 at 1:11 am Comments Off on Getting Your Share of Smallmouth Bass Action! Bass are rather finicky about their environment! If the water isn’t between 68 and 78 degrees, bass are likely to be moving on to waters within their narrow range of comfort – instead of eating. When the weather heats up, bass head for cooler waters. Look for deep pools in the body of water in which you are fishing. Bass are very fond of hiding near the drop-off points of deep holes s0 they stay cool while waiting for something smaller than themselves to stroll by. As the water starts to cool, bass moves back to the shallows (from the deep pools) to do some serious feeding. They must eat enough to carry them through the winter months – no matter how much cold comes their way. During the early chilly mornings, bass are likely to be lazy and slow-moving. As the sunlight strikes the water and warms it, bass will become more active. Under these circumstances, bass like to live in shallow waters, hiding in grasses and weeds, around submerged stumps, etc. How Can You Apply this Info? It is important to know the water’s temperature. You will be wasting your time fishing for bass in a shallow pond if the water is over 80 degrees. Having a topographical map of the body of water in which you fish is a great investment. Predator fish, such as bass, tend to hide in submerged structures (rock piles, weedy areas, around fallen trees, etc. ), watching for a tasty tidbit! The TV meteorologist is your best friend! If you live in an area near water, as we do, the meteorologist adds water conditions to the weathercast: high and low tides, water clarity, water level and water flow. When you find water at the correct temperature, your task is to figure out what he’s in the mood to eat – and serve it up on the end of your line. Commit a random act of kindness: Pass this article along to someone you know! * ‘Missed Opportunity’ – displayed through arrangement with Vantage Point Graphics. Today, I’d like to show the Texas Rig (in East Texas, it’s called “draggin. '” This is an adaptation of the Carolina Rig. This almost 3 minute video leaves out a few things I’d like to mention. It keeps the sinker from damaging the knot and provides a nice clicking sound. Why use a lighter leader than the weight of the line? If the hook gets snagged, you have a better chance of not losing the whole rig. Keep an eye on the mud/grit/sand/whatever comes up around the top of your bullet sinker. Why? If your sinker’s hole is bringing up mud, the area is too soft for bass. They prefer a sandy bottom! Give them both a try; let me know which one works better for your situation! These fish were imported from Europe in 1883; now they are abundant and average between 14 and 18 inches (in length). Lunker brown trout reach 38 lbs., – or more. Smart and wary, your shadow on the water will warn them away for a couple of hours! Catching browns requires patience and luck. The browns “hang out” under fallen branches and in deep pools. They only come to the shallows to eat in the early morning and late afternoon. Favorite treats are mayflies and caddis flies. Brown trout can be caught year-round. However, they are most active in water temperatures between 50 and 65 degrees. Anglers catch brownies using bait casting, fly-fishing and spinning gear. They seem to respond best to spinners, spoons and wobbling plugs. If you are fly fishing, use wet flies, nymph patterns or streamers. These resemble their natural food sources: aquatic and terrestrial insects. If you will be using live bait, opt for cut baits, alewives, smelt and spawn sacs. When I think of brown trout fishing, I think of wading and fly fishing in a river or stream. Other great places to try are spinning or fishing with live bait, along river banks or streams. Trolling in larger rivers or the Great Lakes can be very rewarding. If you are going brownie fishing, this is not the species to take your kids for their first lessons on fishing. Perch fishing is a better choice for kids. Brownies are skittish and very suspicious of noise. This is another one of those fish that prove the adage: If you can see them, they can see you! *This brown trout is shown by permission of Vantage Point – provider of rear window graphics. This is part of their Wild Wings Art Collection. This posting will hopefully help newbies understand how important all that underwater ‘stuff’ is. In the fish world, there are two roles: eat or be eaten! Larger fish are looking for smaller fish to eat, while tiny fish are looking for plankton or other invertebrates for a meal. No fish wants to be a larger fish’s meal; thus, they hide in weeds. Large predator fish lurk in the weeds, waiting for an unsuspecting bait fish. Tiny fish feast on the bits of food caught in the sticky tendrils of the weeds. Cabbage has a thick stock with long, willowy leaves. Bait fish and game fish call these weeds home. 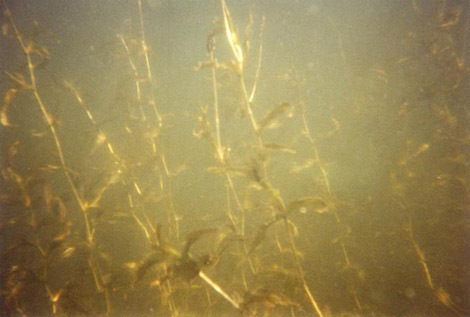 Whitefish, walleye, largemouth bass and suckers particularly like to hide in these weeds. Although bait fish think they are safe, pike and other predators lurk in the shadows, hoping to nab a meal. If you are a duck hunter, you probably know about coontail weeds. They are excellent food for fish and ducks. As a rootless plant, coontail breaks down and feeds reptiles, amphibians, fish and ducks. Coontail exists as deep as 6 and 1/2 feet in water (2 meters), and is shade tolerant. Because it is mostly rootless, it can form dense mats in slow-moving streams and bodies of water. This info is all very good, but how do we use it for fishing? First, use the beds to your advantage. Fish prefer to hide in the weeds – rather than swim around – waiting for a larger fish to eat them! Fish along the irregular weed edges and above submerged weeds. The deeper you are fishing, the lighter your lure should be. 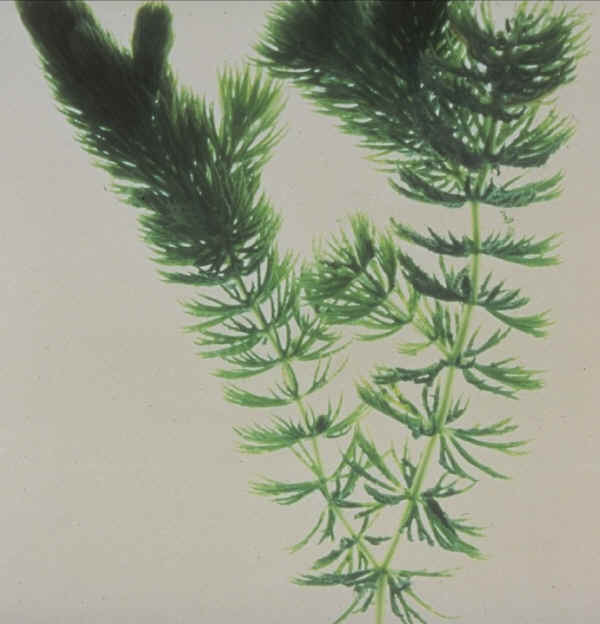 For example, in deep weeds – where light does not penetrate so well, use light-colored lures: white, yellow, light blue, light green. In the depths, these lures will appear larger and brighter. If you are fishing 40 feet down, your red lure looks black in the dim light. At the same depth, your orange lure appears dark brown to fish! Today, let’s talk about the 3 main freshwater trout types in the US. Each has slightly differing habits. Smaller than either the brown or rainbow trout, the “brookie” lives comfortably in water too shallow for the other trout. They use the green vegetation as hiding areas. “Brookies” are aggressive and fairly easy to catch. If you catch a 14 inch ‘brookie’ — it’s a genuine trophy game fish. These fish were imported from Europe; now they are abundant and average between 14 and 18 inches. Rainbows once lived only in west coast waters. Their habitat is very different from the browns and brookies. Rainbows call fast waters their ‘home.’ If you’ve ever seen a rainbow ‘tail-walking,’ you have seen one of the wonders of nature! Keep in mind that trout always have a “Plan B.” When upset or hooked, they rush to a pile of underground rocks or a mass of brush or submerged logs. Often, they leave your hook and line in the rocks or brush as they run away. Remember that trout are very heat-cold sensitive. If it is 90 degrees above the water, they have moved into the deep pools (that are a cool 55 degrees). If you are shivering while you fish (the outside air is a chilly 45 degrees), then the trout are down in the deep pools, where the water is a warm 55 degrees. Trout are opportunistic feeders. What is available to them when you are fishing? If it is spring, there are lots of hatching mayflies, caddisflies and stone-flies. Your best bet is using an artificial fly that looks like these foods. If you are ice fishing, then the trout are looking for minnows. That’s what you need for bait. Aggressive and Fun to Catch! Brook trout are not really trout, but members of the char family. An easy way to determine “what you have” is to look at the underside of your fish. The beginning dorsal fins of ‘brookies’ are always white. Next comes a line of black. the rest of the brookie’s fin is usually orange. Spawning season is from late summer to early autumn and at this time, they are their most colorful. They prefer waters between 47 and 67 degrees. Like his cousins, the rainbow, cutthroat and brown trout, brookie’s prefer deep pools. This is where the termperature is most stable. “Brookies” are aggressive and fairly easy to catch. If you catch a 14 inch ‘brookie’ — it’s a genuine trophy game fish — and it is about 5 years of age (they generally live ~6 years). If you are hoping for a “lunker,” you might want to use live minnows. As the trout grows, he spends more time chasing small fish for a meal, and less eating insects. Fly fishermen indicate that these are the most successful lures for catching trout: spawn egg imitation patterns (ex: single egg patterns ro egg sucking leech), crustaceans (freshwater scud patterns). Of the streamers, anglers are successful with leech , wooly bugger and bait fish imitation patterns. These wet flies are faves with fly fishermen: Quil Gordan, Adams, Black Gnat, LeadwingCoachman, Butcher, Blue Zulu and McGinty. Of the dry flies, these are favorites: Adams, Black Gnat, Black Midge, Cahill, and the Poly Quil Spinner. Nymphs: Prince Nymph, Peeking Caddis, Sparkle Larva and Zug Bug. Hook sizes should range from #10 to #20. *This brook trout is shown by permission of Vantage Point — part of their Wild Wings Art Collection.